FREEBIE! Fry's Word Lists 1-100 and assessment sheets. The assessment sheet has you keeping track of your student's reading all year long. There are 5 columns on the assessment sheet for 5 opportunities to see how your students are reading their HFW. 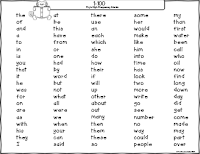 Put word lists in a reading center for students to practice reading words. Students can partner read the words together. 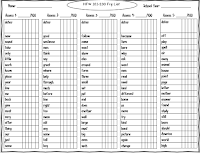 Send word lists home for homework so students can practice reading their HFW. 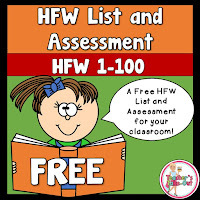 Here is the complete set of Lists and Assessments for HFW 1-1,000. 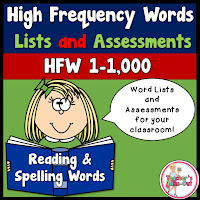 This pack includes two HFW Lists and Assessment Forms for all 1,000 High Frequency Words. Click the picture on the left to read more about it. 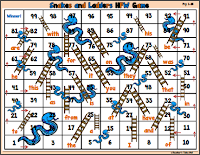 Have you tried Snakes and Ladders HFW Game? These game boards are all about Fry's HFW 1-200! Your students will love reading their words while playing this game. Try the Freebie below to see if you like it. This set also comes in Dolch Words! Here's a set of FREE HFW 1-100 in flashcard form. Try the fun game for beginning readers! ABC Order to the 1st letter is all about HFW. This set includes task cards and worksheets to put in ABC order. All words in the pack are using HFW 1-100! Hopefully you'll find some gooodies to keep your beginning readers busy during reading time. Click below to find more resources for the K-5 Classroom. Thank you! I'm especially grateful for the check-off sheets. These will be so helpful. Thanks for your kindness in sharing. Wow! This will make my assessments so much easier. Thanks for sharing!